baby who would be King. “I myself will tend my sheep and have them lie down, declares the Sovereign Lord” (Ezekiel 34:15). The Lord, as our shepherd, is prevalent in Scripture. 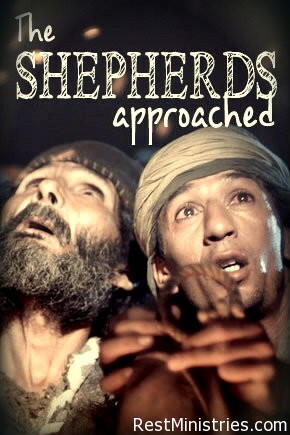 Old Testament passages share of shepherds tending their flocks. David was but a shepherd boy when anointed to be a future king in the line of lineage for the Messiah. I have been pondering “shepherds” as we approach the celebration of the Incarnation. Christ’s first earthly bed was a manger among animals and Mary and Joseph in awe. How could such a humble birthing place and its surroundings hold the Messiah? Those first told of His birth–yes–shepherds tending their flocks, were heralded right into Bethlehem and to the One who, Himself, would grow to be the Shepherd to all. Humble beginnings are not indicative of what is to come. Many of us find ourselves in daily surroundings with feelings and questions for our Shepherd concerning our chronic illnesses and their impact in our lives. They once had a birthing time, but are not indicators of a life of lesser worth any more than Christ’s beginnings were. They are not of lesser worth than the privilege given those shepherds of long ago who were the first in line to see the Glory of His coming. We have Him daily to give us strength and care. What can we see this year as we come to the manger? Jesus’ humbleness eventually led to another wooden place where He was not lain peacefully, but nailed in agony. In between these two events, we come to know what He came to teach us as members of His flock. We are saved by his grace and mercy. Tending to each of us with care is not only a joy for Him, but we, too, can come alongside others to see that each is tended to with His love–no matter how we feel. The first shepherds saw His Glory and we can too if we bow at the manger and let Him give us eyes to see and hearts to follow. Prayer: Oh, Lord! May we ponder the spirit of Christmas in ways anew this year and find You there in splendor. Amen. What is one thing uppermost in your heart that you can bring to the manger this year? As you bow in wonder at all that God has done and has yet to do, what do you sense Him telling you? Filed Under: Coping Skills, Devotionals, Love, What's New? Thanks for these beautiful thoughts, woven together so well. “The first shepherds saw His Glory and we can too if we bow at the manger and let Him give us eyes to see and hearts to follow.” – great reminder and invitation for each of us. We were reminded on Sunday, how the shepherds were some of the most unlikely to be invited anywhere – yet the first God chose to meet His son. Thanks for sharing your thoughts, Fiona. Truly, for those of us who often feel set apart and in isolation wondering if our lives still matter, the first shepherds of Christmas are ones who can inspire. God intervened in their lives so instantly – when they least expected any interruption on a dark and perhaps lonely night and – wow – they were changed forever. May He break through in each of our lives in ways that are as amazing for us personally. I’m STILL in catch up mode & this one was really worth catching up on. Soooooo many great images & connections through what you’ve written. Kerryn – I am grateful that in your “catching up mode” you landed here! I am blessed to read your comments. I found myself re-reading what I wrote some time ago and – yes – you guessed right. I saw new things myself or reminders that mean a lot in my “now”. I think we keep being in places where re-brithing is happening within us.